I now live in New Jersey, pretty much the Jersey Shore, though Red Bank may be considered slightly outside the official Jersey Shore zone. I'm not totally sure. I do know that I am surrounded by cupcake and cake pop shops that I plan to explore. The one I've been to several times is Sugarush, which is a design your own cupcake cupcake bar place. You select your desired cake and frosting flavor and then whatever toppings or fillings you want, or you can choose amongst the offerings they have. I've tried the Oreo explosion, which was very rich but very good, as well as their Snickers and peppermint patty cupcakes. 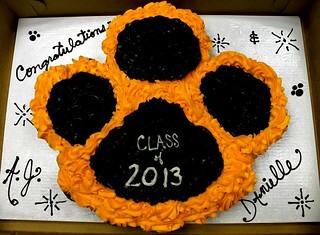 They recently posted this beach cupcake and this adorable paw pull apart cupcake cake on their Facebook page. Next weekend in Marine Park it's Sippin' on the River, so if you're near Red Bank, you can check them out along with assorted food and music. 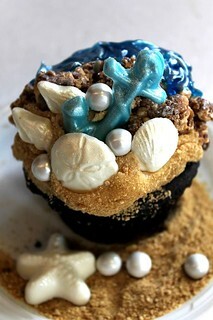 They're located at 37 East Front Street and you can contact them at experiencesugarush at yahoo.com or 732-414-9044 and find out more at experiencesugarush.com. Sugarush makes a yummy cupcake!!!! I love the variety of toppings and frostings. Little Sweet Cakes in Point Pleasant Beach does a nice job too if you are a little farther south.